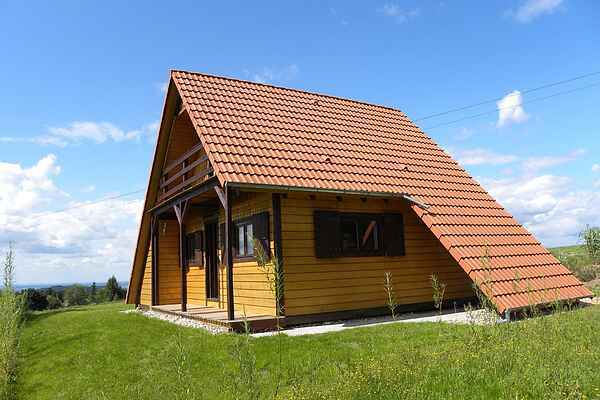 This gorgeous chalet is located at the end of a quiet dead end street in the hamlet of La Hoube, only 5 km from Dabo. It is very mountainous, so there are many winding roads and plenty of beautiful nature. The house is surrounded by a pleasant grassy garden where the children can play football. At only 4 km is the Rocher du Dabo, from where you have a beautiful panoramic view. From the garden in the front of your chalet you have views over this Rocher. Throughout the area are viewpoints. A swimming pool and an 18 hole golf course can be found in Sarrebourg (28 km). Tennis, market, supermarket and a bakery can be found in Dabo. Restaurant in La Hoube (1 km). Castle ruins can also be seen everywhere, e.g., at Haegen (19 km), Wangenbourg-Eigenthal (12 km) and at Nideck (21 km). The latter town also has beautiful waterfalls. Also visit also the famous ship lift Plan Incliné near St. Louis-Arzviller (16 km). The kids will be happy with a day trip to the animal park of Rhodes (49 km). And highly recommended is a day in Strasbourg (46 km) with its famous half timbered houses.